Homemade Vanilla Wafers may look like the commercially made cookies, but they taste better. I think you'll enjoy this tender crisp cookie with its buttery sweet vanilla flavor. I like to make them fairly small. Perfect on their own, or I like to serve them alongside a fruit salad or a bowl of ice cream. And don't forget to try using them the next time you make a Banana Pudding. A few notes on ingredients. For the vanilla extract, make sure you buy "pure" vanilla extract, not the ones labeled "imitation" as they tend to leave a bitter aftertaste. Another idea is to use pure vanilla bean paste which is a thick vanilla extract with the vanilla bean seeds. I also used a combination of All Purpose (plain) flour and cake flour in this cookie batter. Cake flour is a low gluten flour that helps give the cookies a light and tender crumb. However, you could replace the cake flour with an equal amount of All Purpose Flour. And lastly, I added a little baking soda (bicarbonate of soda) to the batter as it gives the cookies their crisp edges. 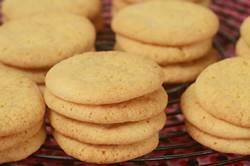 Vanilla Wafers: Preheat your oven to 350 degrees F (180 degrees C) and place the oven rack in the center of the oven. Line two baking pans with parchment paper. In the bowl of your electric stand mixer, fitted with the paddle attachment (or with a hand mixer), beat the butter until creamy. Add the sugar and vanilla extract and beat on medium high speed until light and fluffy (about two to three minutes). Add the egg and cream and beat until incorporated. Scrape down the sides and bottom of your bowl as needed. In a separate bowl, whisk together the flours, baking powder, baking soda, and salt. Add the flour mixture to the butter mixture and beat just until incorporated. Drop (can use a spoon or an ice cream scoop) about one teaspoon (10 grams) of the batter onto your baking sheet, spacing the cookies about two inches (5 cm) apart. Then, with the palm of your hand, gently flatten. Bake the cookies for about 15 minutes, or until they are golden brown. (The longer you bake the cookies the more crispy they will be.) Rotate your baking sheet front to back about halfway through the baking time. Remove from oven and place on a cooling rack. Let the cookies cool for a few minutes on the baking sheet before transferring them to a wire rack to finish cooling. The cookies can be stored in an airtight container for about five to seven days, or they can be frozen. Makes about 60 - 2 inch (5 cm) cookies.